DPUs on Canadian National’s Flint Sub! That’s right, and you saw it here, second. 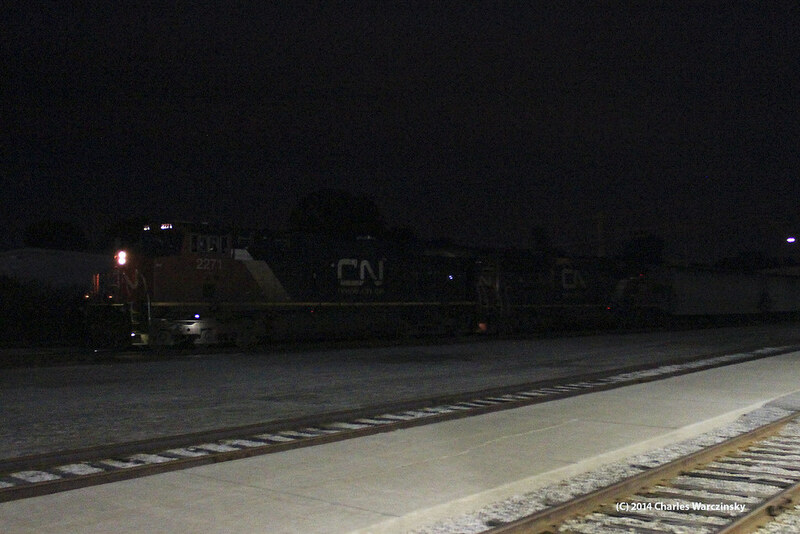 Second because I posted it on the MichiganRailroads.com forums last night. To the best of my knowledge, Canadian National has not run trains utilizing DPU (Distributed Power Unit- “A locomotive or locomotive set capable of remote-control operation in conjunction with locomotive units at the train’s head end.” Source: Union Pacific- http://www.up.com/aboutup/reference/glossary/railroad_terms/index.htm) technology on the Flint Subdivision across Michigan in the past. An unexpected westbound train exiting the tunnel last night apparently changed all of that. We’d been hearing a 360 symbol used in the area, but weren’t sure which train it was, until a westbound came through the tunnel while we were expecting an eastbound to get the light to depart. At first the train looked normal enough, aside from our initial confusion regarding its symbol. 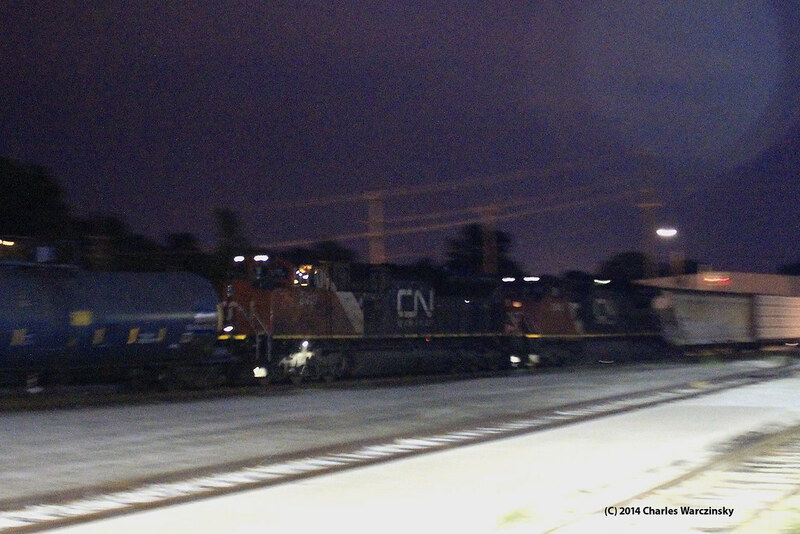 It was powered by two CN locomotives CN 2271 and 5455) and appeared to have a fairly normal manifest freight. Some of the cars in the train were a little unexpected and the slack seemed to be running in/out more than usual, but it looked normal enough, until two more locomotives came over the horizon, cut into the middle of the train and audibly helping pull the train up the grade out of the tunnel. The DPUs were CN 8919 and 2148 (both short hood forward). Behind the DPUs was more of the manifest freight, apparently more of the same kind of cars that were in front of the DPUs. Figuring a report of DPUs on the Flint Sub would be much more credible with video, as M360 departed for points west, we departed for Emmett, figuring we’d catch it at M-19. We arrived with plenty of time to spare, helped by the fact that M360 was limited to 40 miles per hour, giving plenty of time to get set up. Because I’m not as familiar with the video end of my camera as the photograph end (I bought it to take pictures, not video), I’m still learning when it comes to shooting decent video. Reflecting on what we saw last night, I’m starting to suspect there was a reason this train ran after dark. There was nothing on this train that couldn’t have run on any other train on the Flint Sub, other than the one thing that made this train really special. I don’t recall seeing many noticeably empty cars, although I did see a couple cuts of tank cars that look very similar to one of the unit trains we saw in Elkhart a few weeks ago. One of the guys in our group (who, by the way, is DPU qualified) mentioned the tank cars were some of the newer cars that meet the new “safety” standards the tree huggers are pushing for. Reviewing the video, there was at least one empty centerbeam flatcar, but I saw so many loaded centerbeam flatcars this weekend that I forgot about it. There was also a cut of Norfolk Southern 3-bay covered hopper cars, something I always enjoy seeing, but all too often see only when I’m out of position for decent photos. Because I haven’t seen much reaction yet to this event, good or bad, I’m curious to see if other runs have been made like this, or if this is one of the first runs with DPUs on this end of the Flint Sub. I can’t imagine it will be the last though the train also seemed to be a little short (it was under 10,000 feet) to be using the DPUs. I believe the use of DPUs on the Flint Sub trains will also make ‘fanning the Flint Sub more challenging as you won’t be able to just look at the head end to see what the train has for power- something really cool could be buried deep in the train, as has been the case with DPU power I’ve seen on other roads (such as Southern Pacific or Chicago Northwestern units on the Union Pacific in Illinois).